Some classic games should remain buried. We love classic video games. 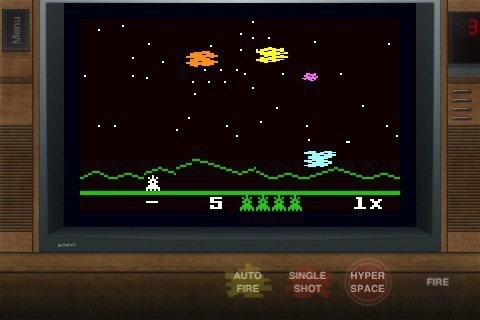 That's why we gave the Intellivision iPhone App a look when the folks at VH1 Classics released it earlier this month. Sadly, time has not been kind to it. Not that the Intellivision was the greatest console on the market when Mattel released it in the 80s. It had the worst control pad ever designed, featuring a disc instead of a joystick and multiple numbered buttons, in which you had to lay a cheat sheet on to learn the functions. Intellivision iPhone works the same way, giving you control schemes similar to the original games. They are mildly easier to control, but too loose for their own good. Take Thin Ice, a game where you control a penguin and circle around enemies on a frozen lake, dunking them in water. Half the time, we couldn't properly do a complete circle around our foes, and sometimes ran into them. Even worse is Chip Shot Golf, a game that works on the simplest of golf fundamentals and still screws them up because the shoddy tap-tap controls. And don't even get us started on Thunder Castle. That game drives us nuts. Six games are available, including the aforementioned titles, Night Stalker (which isn't too bad) and Skiing (which is average at best). The best of the six, Astrosmash, is already included in the free application, while you'll need to pay a buck a pop to download the others. Personally, we advise you to stick with Astrosmash. It plays the best, and shooting a constant stream of dropping asteroids, glowing meteors and UFOs to rack up a high score is incredibly fun, even with the weird touch-screen controls. Unfortunately, the games look more ancient than ever. Pixilated messes await you in each title, whether you're trying to swing your way through the 8-bit holes of Chip Shot Golf or navigating the worst looking lair in Thunder Castle. Astrosmash still looks good, but runs a bit slower than previously released versions. The sound is acceptable, but mostly consists of bleeps and bloops. Finally, there's no sign of the extra Intellivision songs found in other compilation releases, nor any cool George Plimpton ads. 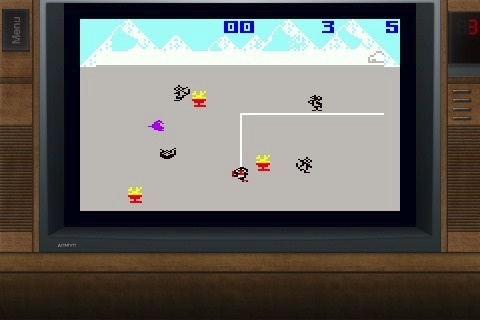 If you download just the basic App, Intellivision isn't too bad. Astrosmash is a game worth installing in your library. Just be careful about going after the others. Even Night Stalker, a potentially cool game with aliens and robots, is unbearable. It appears that some classics shouldn't make a comeback, even ones from Intellivision. What's Hot: Six different titles to choose from, Astrosmash is free. What's Not: The other games aren't worth playing, iffy and loose controls.